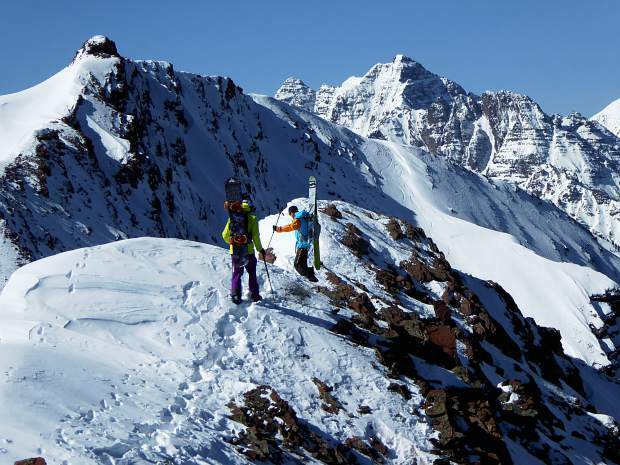 Backcountry skiing popularity climbing in Aspen, U.S.
Art Burrows (right) explores Highlands Ridge for possible new descent variations with snowboard rider Pete Gaston. Art Burrows of Aspen has captured years of trips into the backcountry with his cameras. Check out his work at www.artburrowsphotography.com. Aspen isn’t the only place fueling the surge in the popularity of backcountry skiing and snowboarding. The number of backcountry skiers and snowboarders in the U.S. jumped almost 50 percent between the 2008-09 and 2013-14 winters, according to a snow sports trade association, and preliminary data indicate it’s climbing again this season. The number of backcountry travelers on ungroomed terrain inside and outside resorts soared to 6.34 million during the 2013-14 winter, according to research conducted for Snowsports Industries America. That is up from 4.26 million in 2008-09. Sales of alpine-touring gear used by backcountry skiers hints that interest is growing again this season. Sales of alpine-touring equipment topped $11 million between August and December 2014. That was an increase of 4 percent in dollars and 14 percent in units sold over the same period the prior season. “Backcountry is still going great,” said Kelly Davis, director of research for Snowsports Industries America. While the sales don’t come close to matching alpine skiing, there’s a definitive niche market attracted to the backcountry, she said. They are buying lightweight specialty skis and bindings rather than making do with heavier equipment. “It’s a different crowd that’s getting into it,” Davis said. A nonprofit advocacy group that promotes preservation of winter wild lands and human-powered snow sports believes the growth in backcountry skiing will continue. The Boise, Idaho-based Winter Wildlands Alliance compiled a report that said Forest Service research indicates the number of participants in “undeveloped skiing” is projected to increase by at least 55 percent by 2060. Winter Wildlands Alliance wants to make sure those skiers and snowboarders have a voice when the Forest Service makes policies on who gets to play where in the national forests, said Cailin O’Brien-Feeney, policy director at the alliance. The organization wants to avoid conflicts between motorized winter sports and human-powered winter sports, he said. That can be a problem near parking areas and trailheads. Backcountry use is “really just coming on the radar of public land managers,” O’Brien-Feeney said. The alliance isn’t tracking numbers on where backcountry use is most popular, but O’Brien-Feeney said growth has been greatest in Colorado in general, the Wasatch Range of Utah and the Tetons in Wyoming. “Where you are, that’s part of the culture,” he said. Art Burrows of Aspen has seen the backcountry culture thrive over the past 36 years. He is one of the deans of backcountry skiing in Aspen. When he moved to Aspen from Summit County in 1979, there were only a handful of people heading into the backcountry, including famed mountaineer Lou Dawson and Chris Landry, who is now executive director of the Center for Snow and Avalanche Studies in Silverton. Most backcountry adventurers were wrestling with telemark gear. “Because the gear was not good and it was difficult to learn, it held the numbers down,” Burrows said in an interview earlier this winter. Today’s lightweight gear, which eases climbing but still delivers downhill performance, is a key factor in the popularity of backcountry travel, he said. The cost of skiing, the pursuit of fitness and the desire for something beyond lift-served skiing also have contributed, he said. Burrows said even with the rise in backcountry use in the Aspen area in the past decade or so, it’s still easy to find solitude. There’s a lot of terrain out there, he said. For Burrows, backcountry travel has always been a way to recharge. Burrows said he tries to capture the essence of mountaineering in his photos. “I want to try to communicate the moment,” he said.